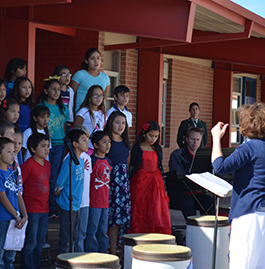 At Willcox Elementary, we have instituted a number of programs to give our students the quality education they deserve. Browse this page to check out everything “extra” WES has to offer your child. The WES gifted education program is committed to providing appropriate services for students who require differentiated educational programs and/or services beyond those normally provided by the regular school program. We offer enrichment and accelerated learning opportunities to meet the cognitive and affective needs of gifted children, including clustering (placing identified gifted students in the same classroom in groups of three to five) with professional assistance by the gifted coordinator to help the classroom teacher prepare challenging programs for each individual gifted student. For information regarding exact testing dates or for a nomination form, please contact the Willcox Elementary School principal at 384.4216 or the special programs director at 384.8736. We encourage all students to use the Learning Resource Center (or library) to check out books and to do research projects. Kindergarten and first grade students may begin to check out books when they have the consent of their individual teachers. All other students may begin in the fall or when they first enroll. Each student is responsible for the books he/she borrows from the library. If a student loses or damages a book, the student must pay an amount based upon the original price and the age of the book. We ask that this charge be paid in the school office before we issue a report card or release records to another school. The library does not charge fines for overdue books, but we may not allow students to check out other books until they return or pay for the overdue books. The library also has an extensive collection of instructional videos and other movies which are available to classroom teachers for use. Here at WES, we believe that music and the arts are an integral and vitally important part of education, which serves to benefit the students’ academic learning! Our music program encourages an intensity of effort and focus that is healthy for the elementary school aged child and provides opportunities for our students to be active learners! Social and community interaction skills through meaningful public performance. Whether or not the student chooses to continue music programs throughout his/her middle school and high school experience, our program is designed to teach the student how to generate multiple solutions to problems and promote the practice of long term goal setting! The Parent Advisory Committee (PAC) of Willcox Elementary School meets at least four times each year to assist teaching staff and administration in decisions that are made for the benefit of our students. We invite WES parents and community members to become active participants of our PAC. For further information, including dates and times of upcoming meetings, please contact the WES office at (520) 384.8603. WES understands that being educated with English as a second language can be very hard on young students. Our Sheltered English Instruction classes provide experiences in learning and reviewing English when your child is learning it as a second language. We like to begin by offering a basic diagnosis of your child’s English proficiency, and then we develop an instruction that is specific to your child’s needs. We know some students require special needs, and our Special Education program does just that. Our special program provides numerous services to children with varying degrees of academic, emotional, physical, or psychological difficulties that slow learning. We provide these services for students in preschool through grade three; however, we do not provide services without the permission of the parent/guardian. If you feel your child is in need of a special education, please come speak to us about it. The Title I Reading/Math program at WES is an adaptive educational program that enriches the student’s learning environment and provides extra instructional time for those students who are achieving below their present grade level. WES is a School-Wide Title I school; therefore, we are able to provide the opportunity for extra assistance in the classroom for all students who need it. WES does not take substance abuse lightly, and we believe educating students at an early age will positively affect their lives in the long run. The Willcox Against Substance Abuse prevention program encompass grades K–3 and includes content on drugs, alcohol, and tobacco for the purpose of developing students’ ability to make intelligent choices based on facts and to develop courage to stand by their own convictions. Our program provides instruction about the nature and harmful effects alcohol, tobacco, narcotic drugs, marijuana, and other dangerous drugs have on the human system as well as the nonuse and prevention of use of these substances. The program also emphasizes the therapeutic benefit derived from the use of drugs prescribed by a health professional.